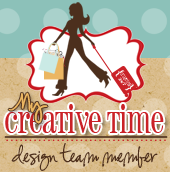 Welcome to another fabulous 3D Wednesday at My Creative Time!! It has been a crazy week at home due to some sickie kids and a sickie hubby!! Thank goodness everyone is getting better because it sure took a lot out of me! For my project, I made a cute valentine home decor..I was inspired by a picture I found on Pinterest. Here is the link. Instead of using photo's, I made some flowers using Miss Emma's wonderful stamps. For my leaves, I used the Teeny Tag Greetings set. How cute is that!! Unfortunately the candy didn't last very long at my house..hee hee....I bought the tin bucket in the dollar section at Target. I found the lit branches at Michael's. The battery box is hidden inside the tin bucket. I hope you liked today's project. Don't forget to visit the other fabulous DT members. Come back tomorrow for another Throwback Thursday Challenge..Big Crafty Hugs!! nancy this is so cute! whoo hoo, I can finally comment on your blog!!! What a great find for your branches and bucket. A wonderful project that you can all enjoy...even minus the candy. Great job! Hi! My name is Nancy and have been scrapbooking for over 3 years. I made an attempt 10 years ago but I really did not get into it. I am married to the love of my life and have three wonderful kids. I really don t have a style since I love doing it all! My hubby says Im out of control when it comes to scrapbooking..Im just getting started!